I was tagged by Darlene to post a picture of me in red. 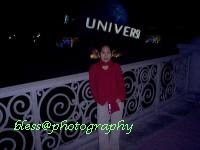 I can't find a latest one but I got this picture taken 2 years ago when we went to Orlando, Florida. We spent our New Year their in 2006. And another picture of our DD wearing her Gap RED shirt. An AIDS awareness shirt.